We also offer in-car driving lessons, parent-taught and adult courses. Required for Texas teens 14 to 17 years old, our online course (also known as the Texas AMI Course) is the safest and most convenient way to earn your Texas drivers license. Our Texas teen drivers ed course successfully fulfills the drivers ed classroom requirement – and does so in an engaging, convenient online format. Study anytime and anywhere with an online Texas AMI course that's accessible from any Internet-enabled device. As a plus, completing our Texas teen drivers ed course enables you to bypass the hassles of a DPS office and allows you to take the DPS knowledge test online for free! Getting your learners permit has never been more convenient. Our Texas AMI course not only teaches you the basics of driving, but also equips you with knowledge on defensive driving techniques to maximize your safety behind the wheel. Additionally, we'll teach you how to deal with potentially dangerous situations on the Texas roads. As a TEA/TDLR-licensed school with more than 25 years of experience, we have the knowledge, expertise, and familiarity with Texas driver safety to ensure your success behind the wheel. Get started today and find out why we're the only school in the country that is approved by the Road Safety Educators' Association and accredited by the Driving School Association of the Americas. Log in with any device, anywhere, at any time! 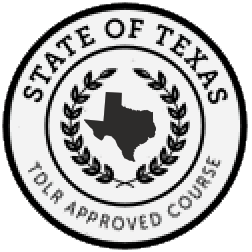 Our Texas teen drivers ed online course was initially approved by the Texas Education Agency (TEA) and is now licensed by the Texas Department of Licensing and Regulation (TDLR). The curriculum covers everything on the DPS permit test and more. Our interactive lessons help you understand and remember the information you need to be a safe driver. Get behind the wheel fast: complete the online course while you take in-car lessons with our professional driving instructors! Take the required DPS knowledge test online for free! The course is all online for your convenience. Whether you log in on your desktop or laptop, your place in the course is automatically saved. You get unlimited access to the course, so you can review information whenever you want. Get your Certificate of Completion—mailed for free! After you have finished the first 6 hours of the online course and turned 15 years old, it's time to take the DPS knowledge test (covering road signs and road rules) to earn your Texas learner license, also known as an instruction permit. You can now take the official DPS knowledge test for free through DriversEd.com! You'll earn your permit fast and get behind the wheel in no time! Our Texas teen drivers ed course covers everything you need to know for the test. Plus, you'll even get 50 free online practice tests to help you prepare for the real deal. Once you've completed the first 6 hours of Texas teen drivers education and have your learner license, you can start in-car lessons with us too. It's the fastest way to start driving! If you choose DriversEd.com for your behind-the-wheel training, you'll learn to drive in a MINI Countryman with our patient, professional instructors. Our in-car lessons cover everything from the very basics to the most complex technical maneuvers. We'll prepare you for the DPS driving skills test, too! Just sign up for our Texas in-car driving lessons, and complete the rest of your online drivers ed course while you get your behind-the-wheel training.